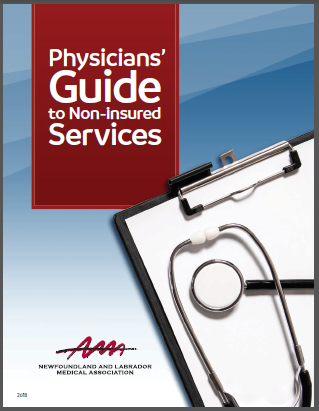 A new, revised Physician's Guide to Non-insured Services has been released. The previous recommended hourly rate had been in place since 2008, and there had been no revisions to the rates or the content of the guide in the intervening years. A Working Group of family physicians and specialists met and drafted a 2018 edition of the guide, which was subsequently approved by the NLMA Board of Directors, to assist physicians and their staff with billing non-insured services. The revised guide covers primarily non-procedural medical services such as the completion of forms and related examinations, and information on medico-legal services.